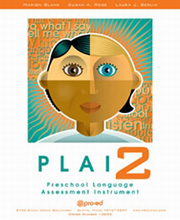 The Preschool Language Assessment Instrument-Second Edition (PLAI-2) is a revision of a classic test, which assesses children's abilities to meet the demand of classroom discourse. Normed on a sample of 463 children residing in 16 states, PLAI-2 tells you how effectively a child integrates cognitive, linguistic and pragmatic components to deal with the full range of adult-child exchange. Teachers, speech-language clinicians, and those in special education will appreciate the ease-of-use and multi-faceted information this test provides. Characteristics of the total normative sample relative to socioeconomic factors, gender, disability, and other critical variables are the same as those reported in the Statistical Abstract of the United States (U.S. Bureau of the Census, 1999) and therefore are representative of the current U.S. population. Studies showing the absence of gender, racial, and ethnic bias have been provided. Reliability coefficients are provided for subgroups of the normative sample (e.g., individuals with disabilities, African Americans, Hispanic Americans, gender groups) as well as for the entire normative sample. Many validity studies have been conducted; special attention has been devoted to showing that the test is valid for a wide variety of subgroups as well as for the general population. The original black-and-white line drawings have been replaced with full-color illustrations that have been updated with increased gender and ethnic representation. Each item on the test was re-evaluated using both conventional item analyzes to choose "good" items and differential item functioning analysis to find and eliminate potentially biased items. The Receptive Subtest is sufficiently comprehensive and reliable that examiners can have confidence in its score when testing children with limited speech. Easy-to-use scales have been added to permit examiners to gain a fuller understanding of the pragmatics aspect of a child's communication.